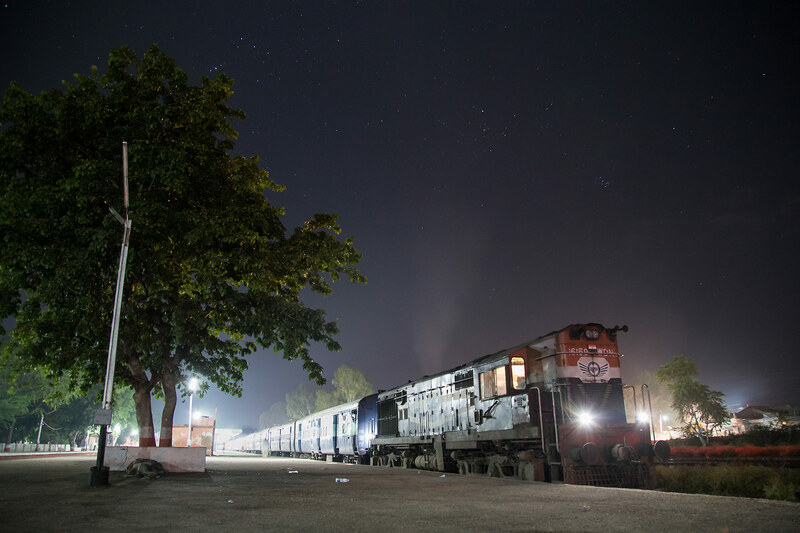 It was still completely dark as I awoke to my alarm in my “private” 2AC berth onboard the 19575 Okha – Nathdwara express. Through the window the moonlit desert flashes by and our hardworking ALCO diesel locomotive can be faintly heard upfront. 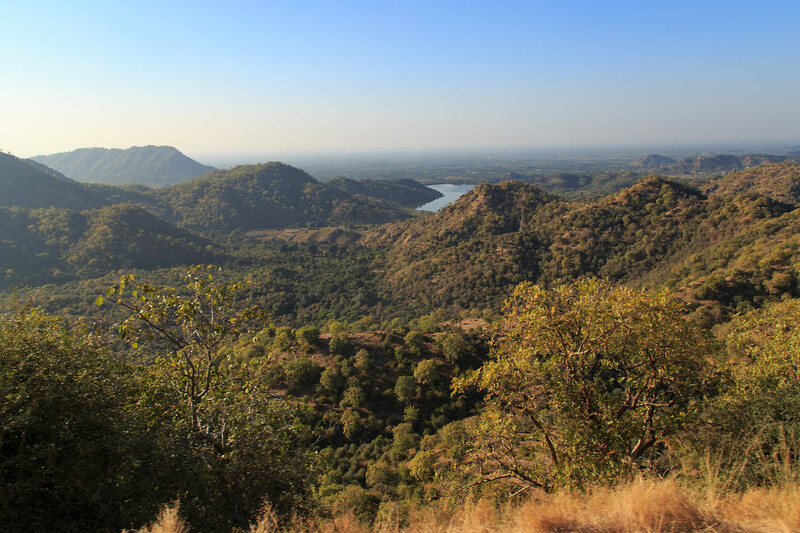 Soon we arrive into the small outpost in the desert that is my destination for today, Mavli Junction. 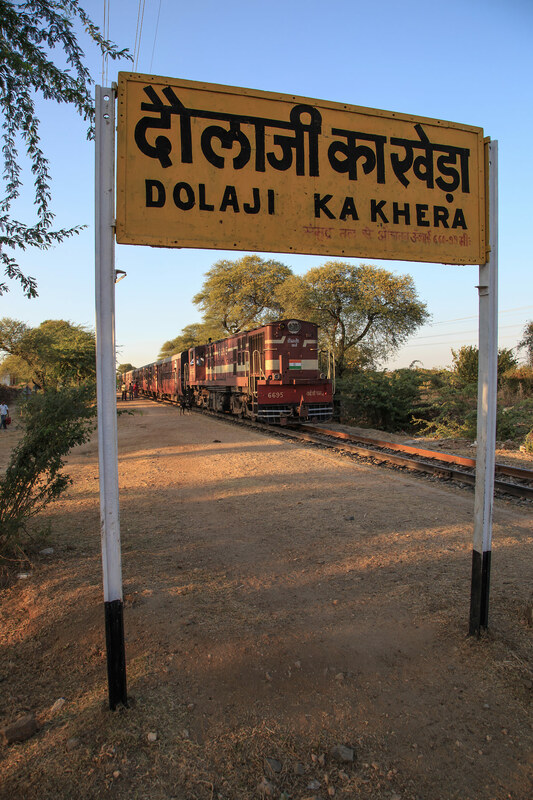 Mavli is the junction between the main Delhi to Udaipur broad gauge mainline and the metre gauge branch line between Mavli and Marwar. 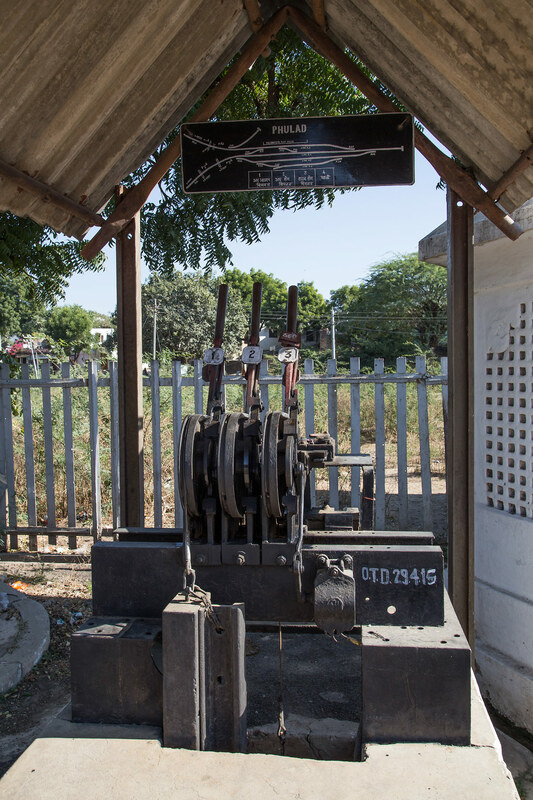 Before the days of gauge conversion Mavli was a more important place, the Delhi to Udaipur line continued all the way to Ahmedabad where it met the vast Gujarat metre gauge network. 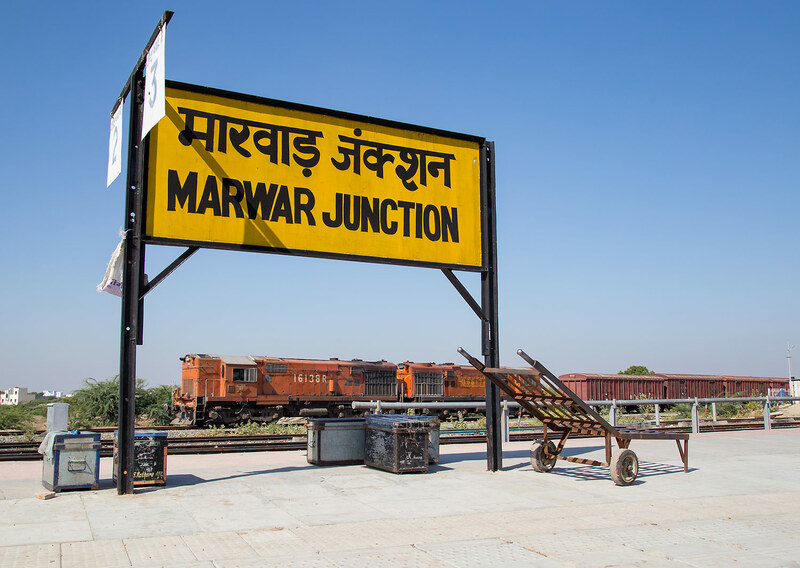 The Mavli – Marwar branch provided and important shortcut between Udaipur and Jodphur as well as the northern metre gauge mainline in Marwar. In addition there was a small branch line to the town of Bari Sadri which extended south. 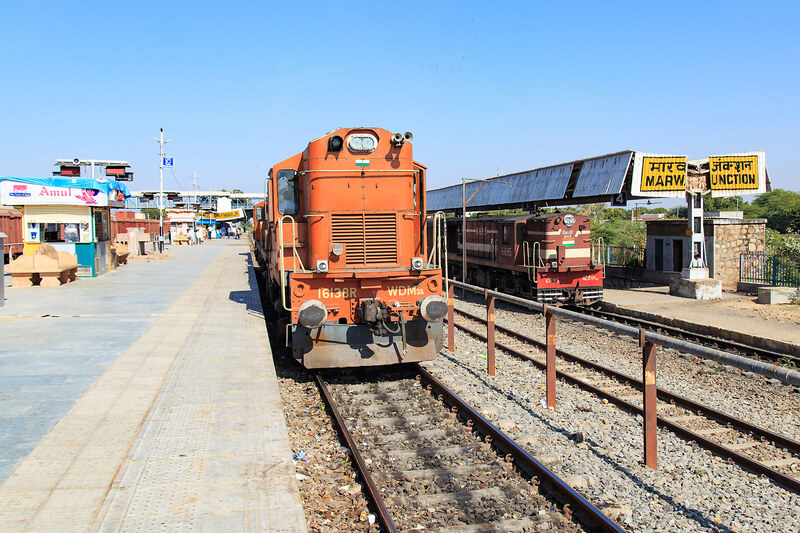 Today the through route to Jodphur has been broken by gauge conversion as has the direct connection to Ahmedabad. Even more unfortunate was that the Bari Sadri branch was closed just weeks before my trip. For those interested in a glimpse back at Mavli in its prime click here for this steam era trip report. 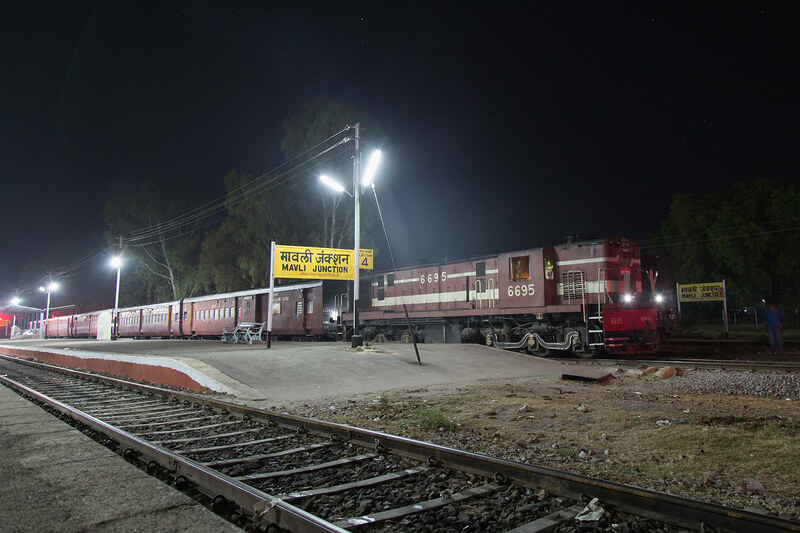 It was about 5 AM when I stepped down from my coach and the stars shone brightly overhead, our Ratlam WDM3A quickly detached from the train and ran around for the short trip up to Nathdwara Terminus, the final destination of the train. This is the one train per week that runs on the new broad gauge line that was laid parallel to the metre gauge line up to Nathdwara, seemingly a colossal waste of money. The train was relatively empty the whole journey hence my otherwise unoccupied 4 bed cabin. After about a 10 minute stop 16150 notched up and the distinctive ALCO chug filled the air as the train faded off into the night. 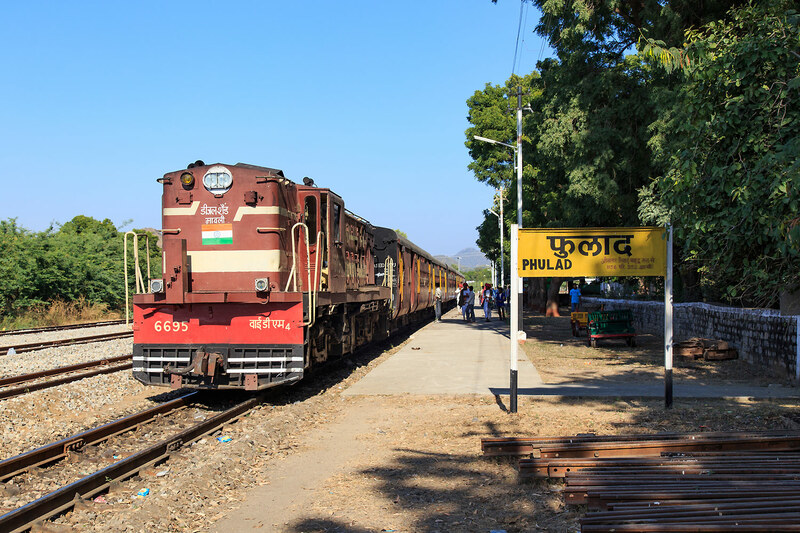 It would be 2 hours until the 0700 departure of 52076, the Mavli – Marwar metre gauge passenger, thankfully though there were several express trains scheduled to stop in Mavli in the intervening hours to keep me entertained. (Below Left) Phulera YDM4 6695 sits on platform 4 after assembling stock for the 0700 train. (Below Right) 19665 the Khurajao to Udaipur city express makes a quick halt behind a freshly rebuilt Abu Road WDM3A as dawn begins to break. As the sky brightened I walked over to the metre gauge diesel shed which was still devoid of activity. 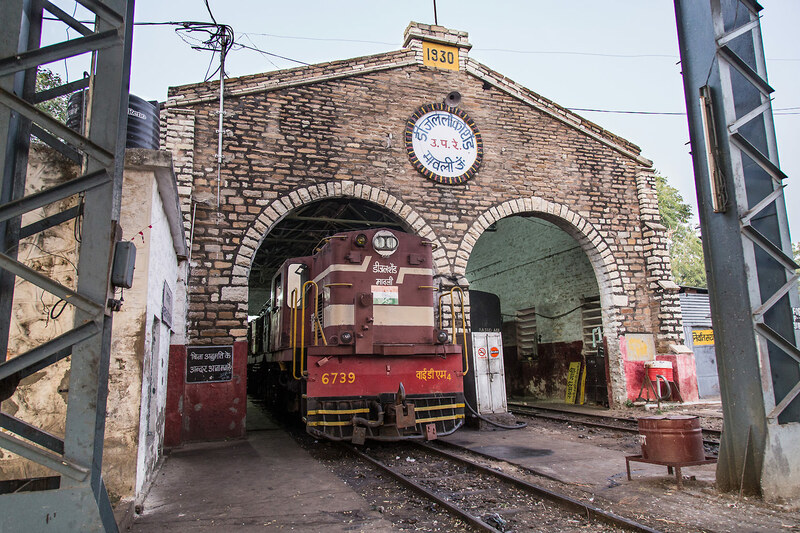 As a result of the fragmentation of the metre gauge network many ancient steam locomotive trip sheds have been repurposed into satellite diesel sheds, Mavli was a true gem with a beautiful stone shed built in 1930. Just before 0700 12991 the Udaipur to Jaipur intercity arrived, clattering over the rusty diamonds of the out of service Bari Sadri Branch, this train is the only link for Udaipur passengers to the Marwar bound MG train, if this train is late then often passengers will be stranded here for hours as the next train is not until late in the evening. Soon it was time to go and we departed Mavli right on time, just as we were departing the stock from my night train passed us as it headed to Udaipur. Since there are no servicing facilities in Nathdwara the train spends the day in Udaipur before returning empty again to Nathdwara to go back to Okha. Click below for a video of the trip starting in Mavli. 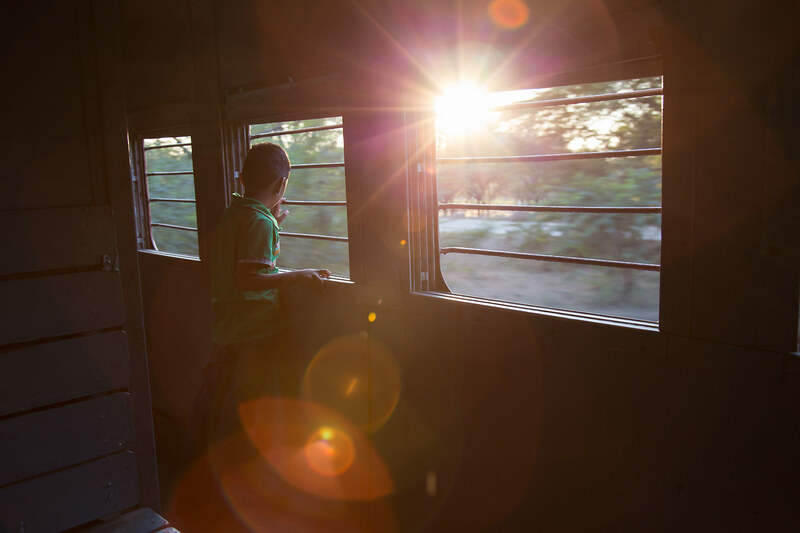 I had planned this part of the trip around meeting up with my friend Vic Lines from the UK who has travelled extensively by rail in India and was immensely helpful in planning this and the previous trips. Since there are no hotels in Mavli they were staying in Kankroli. Despite some issues with their rickshaw over they made the train and I met Vic and his friend Andrew Jones, a fellow seasoned Indian traveller. 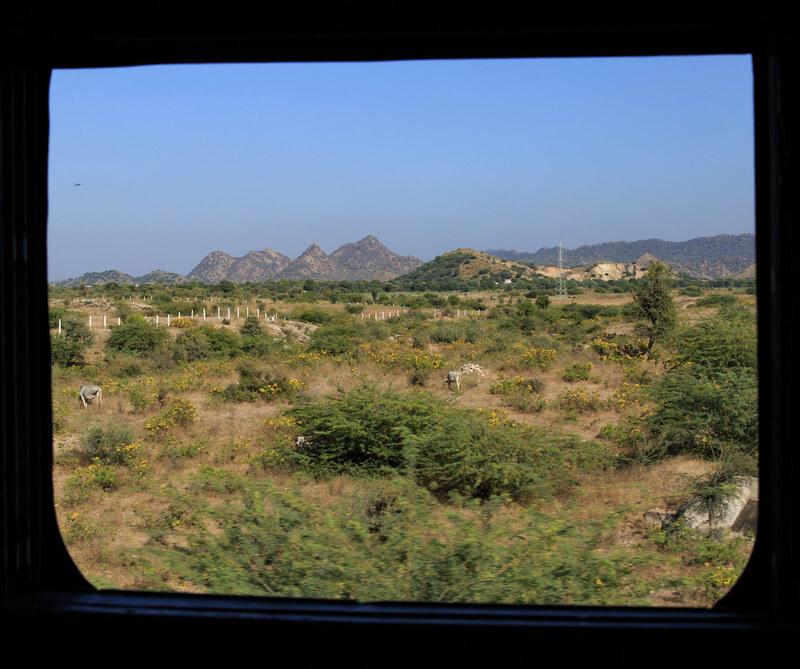 Due to the very rural nature of the route we had a compartment to ourselves for most of the trip, the scenery was surprisingly mostly flat but this would change soon. The line see’s very sparse traffic and we met the only opposing train at Charbhuja Road. The line at the time saw only two pairs of trains per day. At Goram Ghat we paused for a few minutes, Goram is the start of the ghat segment that this line is famous for and there is still plenty of evidence of busier days when banker locomotives for the ghats were serviced here. A line of derelict coaches filled the siding, brought here as the metre gauge contracted all around. 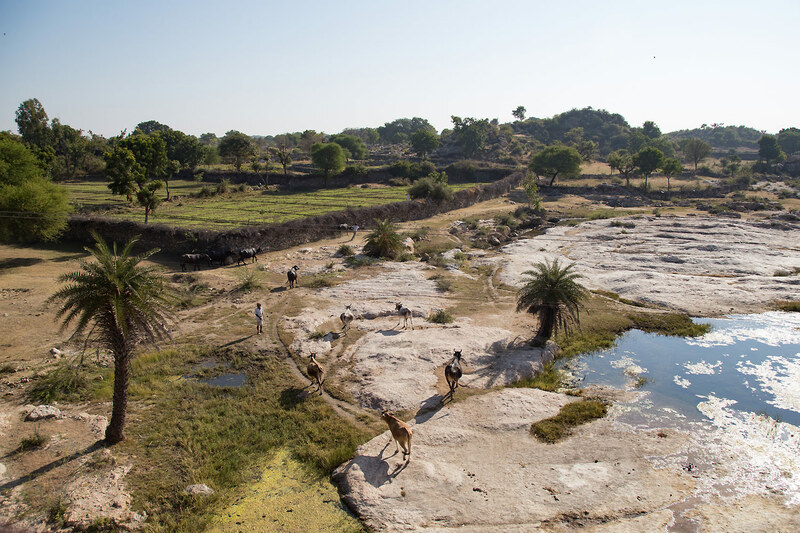 Among them are the somewhat famous tankers used to move “Sweet water” from Goram Ghat to Marwar which does not have any natural potable water, a new pipeline or trucks must be doing the job now as the tankers were all out of service. Interestingly a few foreign tourists joined the train here, I would later find out from talking to them that the train is included as part of a package tour from nearby resorts. I was also starving after having not eaten all day and hardly anything the day before so I bought a bag of fried something here, food is not easy to come by on this line. 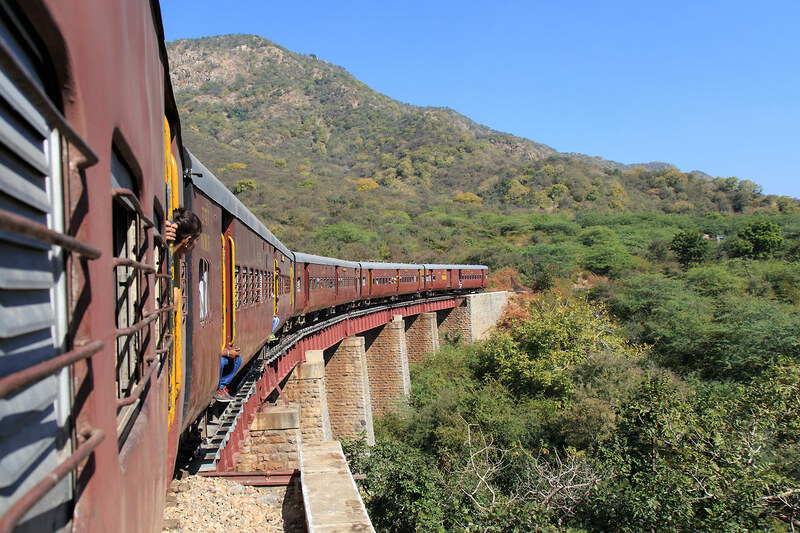 True to what I had expected the scenery for the next 20 kilometers was indeed spectacular as we ran on the edge of steep valleys, across numerous bridges and through the only tunnel on the line. 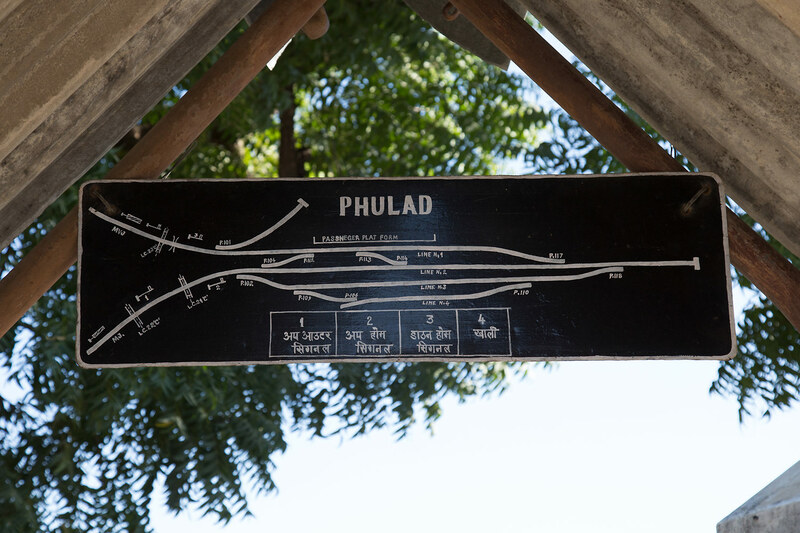 The gradient is so steep that the line has a series of runaway tracks where the train must stop and either the assistant loco pilot or in other cases a switchkeeper must line the track for the mainline. The switches are normally lined for the runaway track so if a train fails to stop the steep runaway track will prevent it from continuing downhill and derailing. 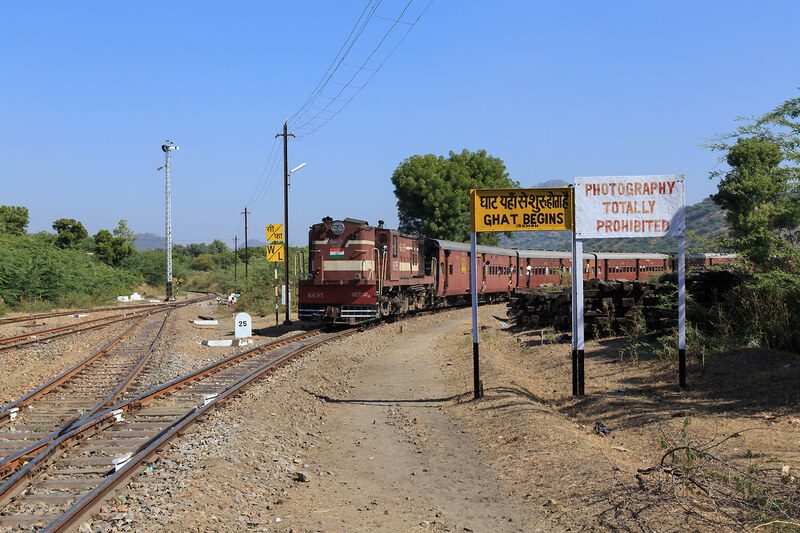 Seemingly in the middle of nowhere we stop at Goram Ghat station, the station in busier times served primarily as a crossing station since few people live in this isolated area. Today the station is just a unmanned halt and caters mainly to Grey Langur monkeys who wait patiently for the train knowing the passengers will throw them food. Just a few minutes after departing Goram we screech to a halt, once again for animals, this time a cow has wandered onto the tracks. 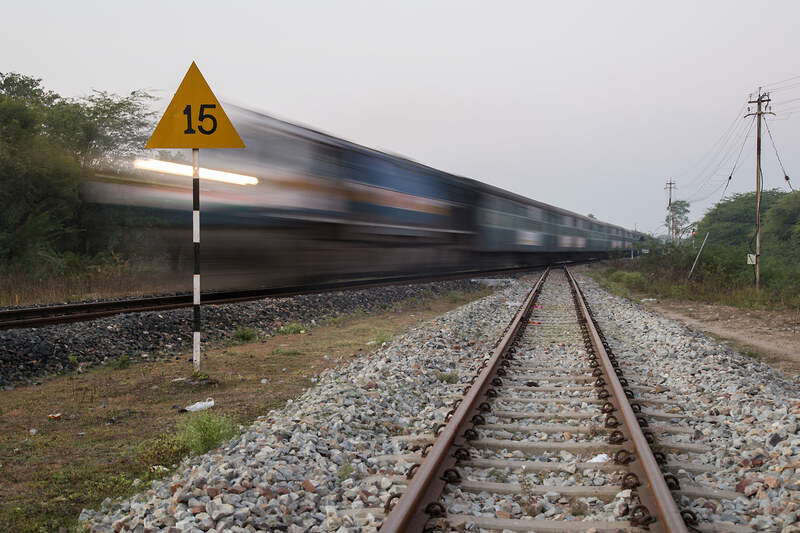 Due to the slow speed metre gauge trains often are able to stop before hitting animals on the tracks. I used this quick stop to my advantage and jumped out for a bonus photo. Phulad is the end of the ghat section and there is a final runaway track just outside the station, knowing this I quickly jumped down as soon as we came to a stop and got my favorite shot of the day of the train passing the runaway track. Knowing the station was just a short distance away I didnt rush to board the train as it moved away but surprisingly it stopped again before the station and I was able to get a shot of the train entering station with the infamous “Photography Strictly Forbidden” sign. Maybe these signs date from busier times but regardless no one cares at all about them today. While photography can get you in trouble all over India I find it extremely ironic that these signs are here at such a remote line while I have never seen similar on the busy mainline routes. 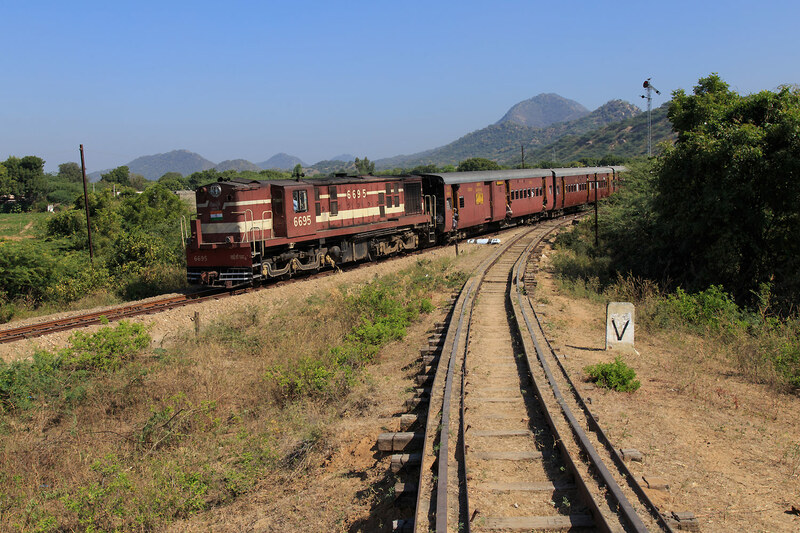 In Phulad the locomotive runs around its train and there was plenty of time for photos, here again the yard was full of derelict coaches, in past times I can imagine freight cars filling the yard as long trains were broken apart to travel up the ghats. 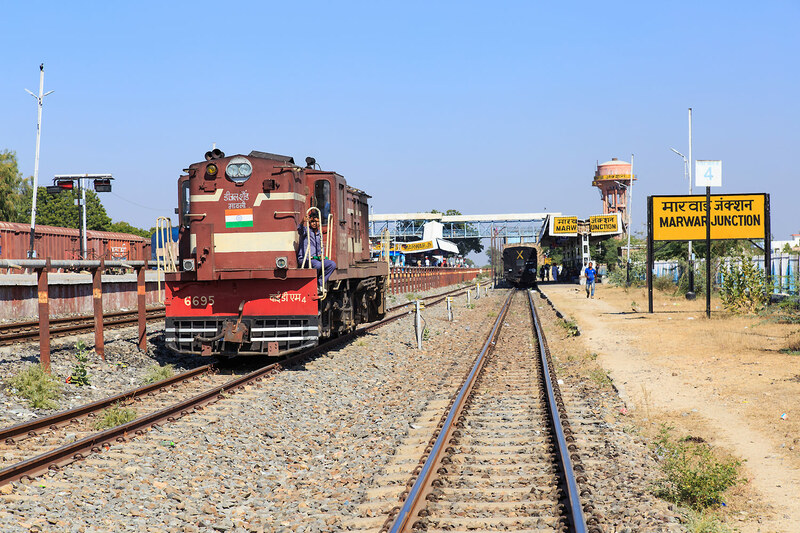 The remainder of the line to Marwar is again fairly flat and straight and in no time we arrived at Marwar Junction parallel with an ALCO hauled passenger on the broad gauge. I also spied two WDM3A’s sitting on a freight so I dashed off to go get some pictures as soon as we stopped. Vic and Andrew unknown to me meanwhile ran off in search of some food. 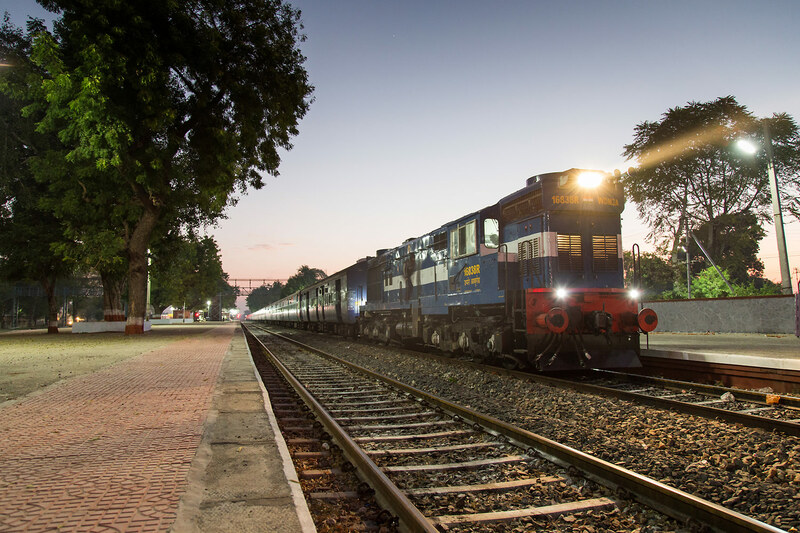 Given that it was going to be a long trip back to Mavli that evening photographing ALCO’s was probably the right choice given how many problems I’ve had getting sick in India. 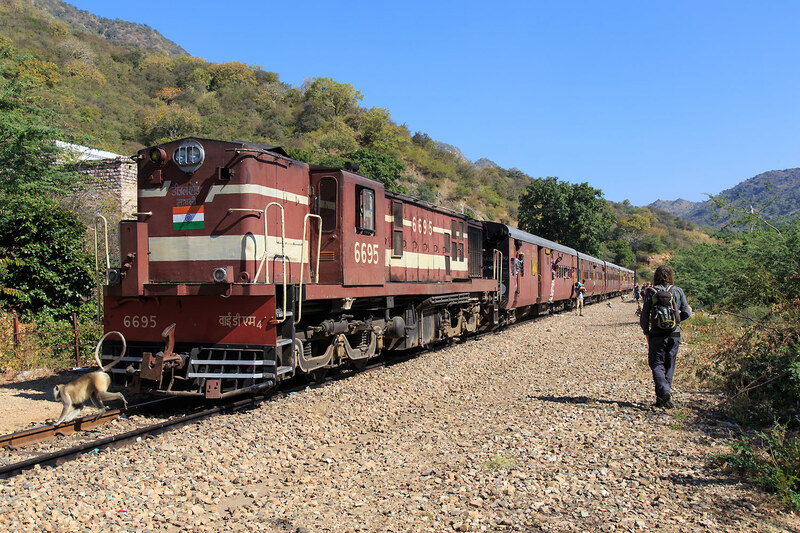 Unfortunately the ALCO’s were not going anywhere quickly and the two uncoupled and ran around the train, presumably to go towards Jodphur. I then to went in search of food, finding nothing except very questionable looking samosa’s and other fried things sitting out in the sun. There was heavy train traffic but unfortunately all of it was hauled by new EMD WDG4’s which now dominate this part of the network. 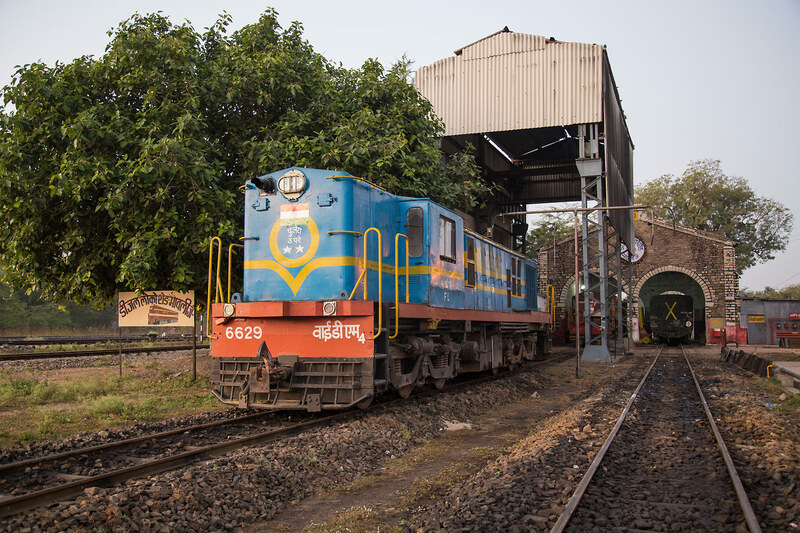 Of interest was the double stack trains, a new development in India. 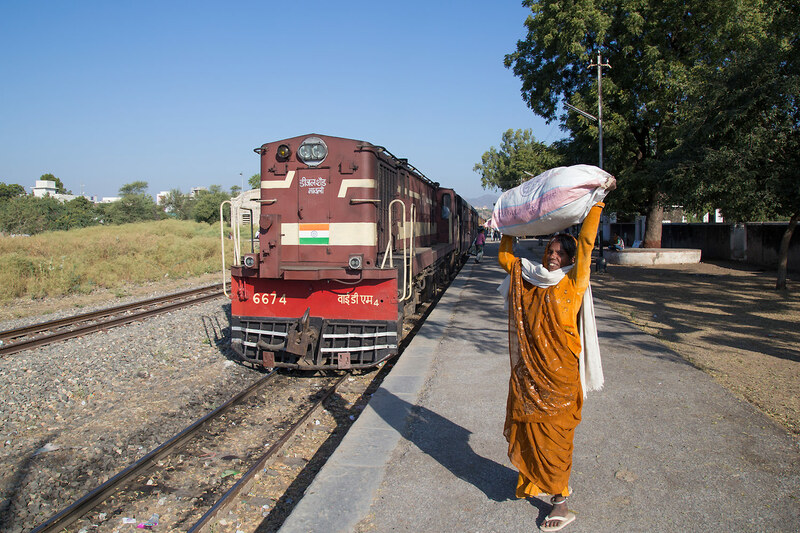 This corridor is chock full these towering trains on their way from the ports in Gujarat to the interior. It was soon time to go and we got in the last coach so we would be in the first after the reversal. With the steep grades we were hoping for some good ALCO noise going up the ghats but sadly that was not to be. In Phulad I bought another bag of friend crisps which would be my sustenance until we got the Mavli. 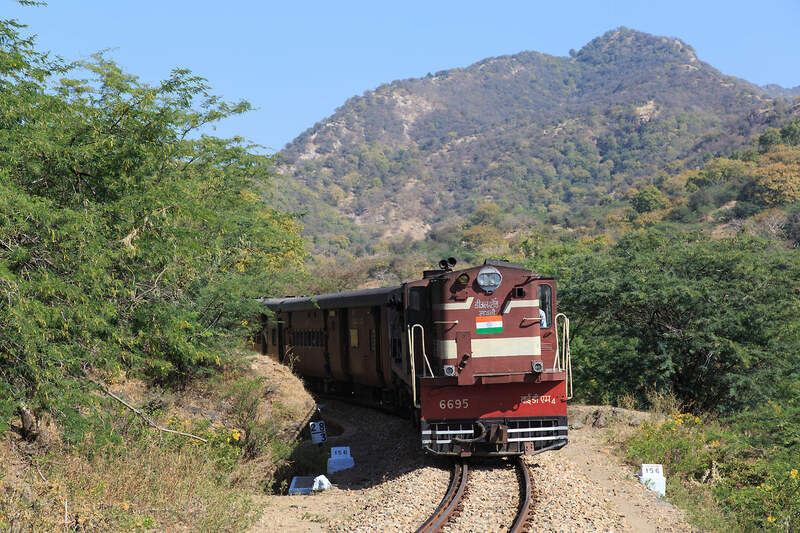 We took off up the ghats but sadly we made slow progress and our locomotive never got above the 4th or 5th notch. Still the scenery looked even better in the low evening light, it was certainly enough to make one wish that the line saw more than 1 train a day, it would be a great place to spend the day photographing. I captured the uphill run through the ghats on video, at some point whenever I finish the video I will link it here. 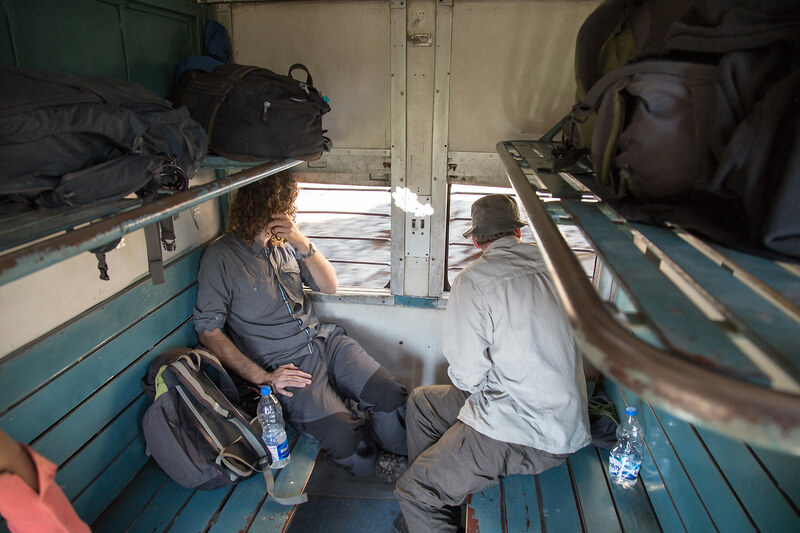 While on the way back we got word of that there had been a massive derailment in Uttar Pradesh with many fatalities, even scarier was that Vic and Andrew had planned on travelling the same train this evening. Vic wanted to ride this train for mileage collection but with the derailment it was questionable if tonights train would even run. At Mavli Vic decided to continue with the plan while Andrew decided it was too much insanity to do so. To add insult to injury Vic’s train to Ajmer pulled in behind a unexpected EMD locomotive, I wished Vic the best of luck and then waited with Andrew for the arrival of my 12992 Jaipur to Udaipur intercity express while he decided on taking an overnight to Indore to visit the metre gauge there. 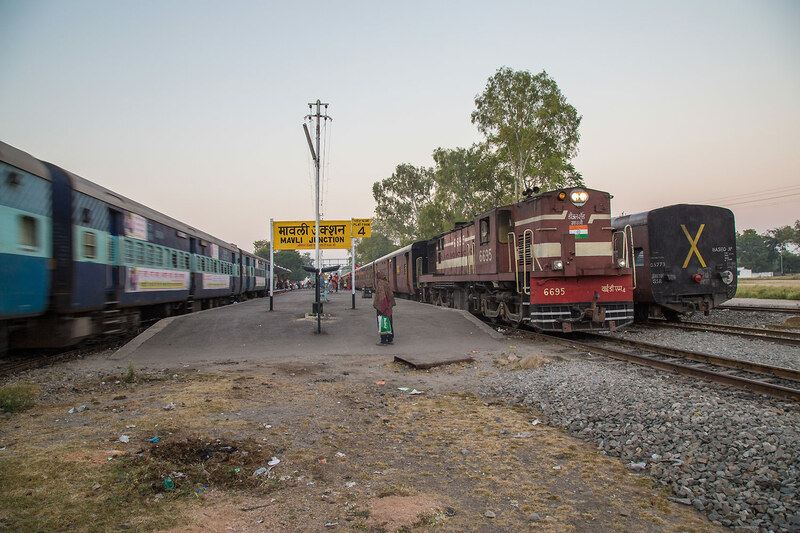 The short ride to Udaipur was uneventful and I was met at the station by one of my great uncles who would be graciously hosting me for the next day in Udaipur. 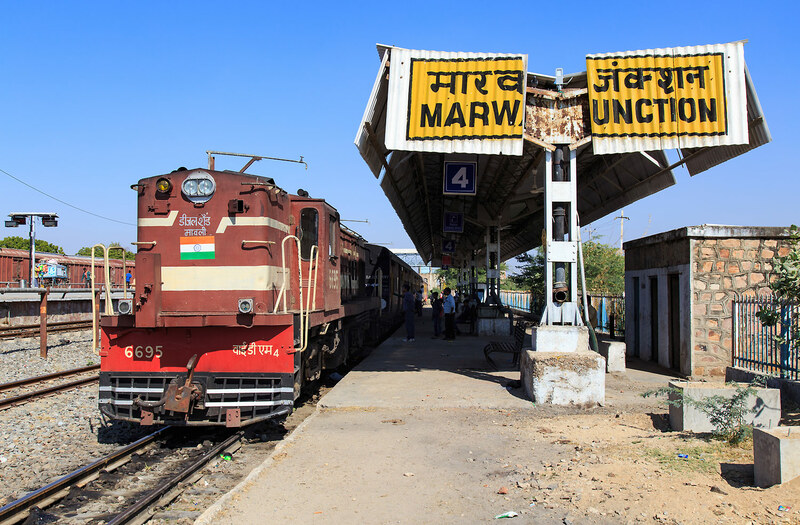 The Mavli to Marwar line is still in operation as of this writing in May 2018 but one pair of trains has been cancelled leaving the line with only a single daily service. 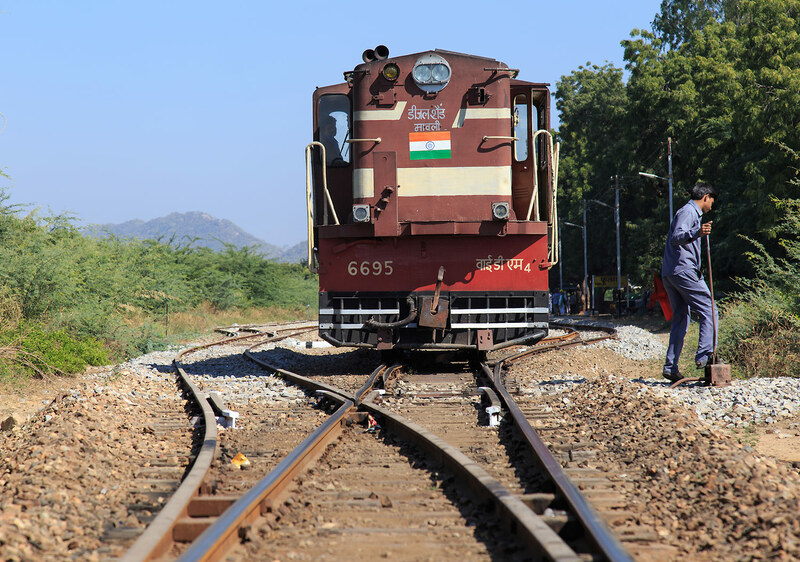 While the railways has promised to preserve the line it seems highly questionable now with the reduction of service. I made one more visit in December 2017 which will be shared here soon. You have described the trip and the area in plain endaring language: Your photographs are the best! I have shared one of them and also of a steam loco from a link you had shared! Thank You!!!! !